Neuropeptides are related to peptide hormones, and in some cases peptides that function in the periphery as hormones also have neuronal functions as neuropeptides. The distinction between neuropeptide and peptide hormone has to do with the cell types that release and respond to the molecule; neuropeptides are secreted from neuronal cells (primarily neurons but also glia for some peptides) and signal to neighboring cells (primarily neurons). In contrast, peptide hormones are secreted from neuroendocrine cells and travel through the blood to distant tissues where they evoke a response. Both neuropeptides and peptide hormones are synthesized by the same sets of enzymes, which include prohormone convertases and carboxypeptidases that selectively cleave the peptide precursor at specific processing sites to generate the bioactive peptides. Neuropeptides modulate neuronal communication by acting on cell surface receptors. Many neuropeptides are co-released with other small-molecule neurotransmitters. The human genome contains about 90 genes that encode precursors of neuropeptides. At present about 100 different peptides are known to be released by different populations of neurons in the mammalian brain. Neurons use many different chemical signals to communicate information, including neurotransmitters, peptides, and gasotransmitters. Peptides are unique among these cell-cell signaling molecules in several respects. One major difference is that peptides are not recycled back into the cell once secreted, unlike many conventional neurotransmitters (glutamate, dopamine, serotonin). Another difference is that after secretion, peptides are modified by extracellular peptidases; in some cases, these extracellular cleavages inactivate the biological activity, but in other cases the extracellular cleavages increase the affinity of a peptide for a particular receptor while decreasing its affinity for another receptor. These extracellular processing events add to the complexity of neuropeptides as cell-cell signaling molecules. Many populations of neurons have distinctive biochemical phenotypes. For example, in one subpopulation of about 3000 neurons in the arcuate nucleus of the hypothalamus, three anorectic peptides are co-expressed: α-melanocyte-stimulating hormone (α-MSH), galanin-like peptide, and cocaine-and-amphetamine-regulated transcript (CART), and in another subpopulation two orexigenic peptides are co-expressed, neuropeptide Y and agouti-related peptide (AGRP). These are not the only peptides in the arcuate nucleus; β-endorphin, dynorphin, enkephalin, galanin, ghrelin, growth-hormone releasing hormone, neurotensin, neuromedin U, and somatostatin are also expressed in subpopulations of arcuate neurons. These peptides are all released centrally and act on other neurons at specific receptors. The neuropeptide Y neurons also make the classical inhibitory neurotransmitter GABA. Invertebrates also have many neuropeptides. CCAP has several functions including regulating heart rate, allatostatin and proctolin regulate food intake and growth, bursicon controls tanning of the cuticle and corazonin has a role in cuticle pigmentation and moulting. Generally, peptides act at metabotropic or G-protein-coupled receptors expressed by selective populations of neurons. In essence they act as specific signals between one population of neurons and another. Neurotransmitters generally affect the excitability of other neurons, by depolarising them or by hyperpolarising them. Peptides have much more diverse effects; amongst other things, they can affect gene expression, local blood flow, synaptogenesis, and glial cell morphology. Peptides tend to have prolonged actions, and some have striking effects on behaviour. Neurons very often make both a conventional neurotransmitter (such as glutamate, GABA or dopamine) and one or more neuropeptides. Peptides are generally packaged in large dense-core vesicles, and the co-existing neurotransmitters in small synaptic vesicles. The large dense-core vesicles are often found in all parts of a neuron, including the soma, dendrites, axonal swellings (varicosities) and nerve endings, whereas the small synaptic vesicles are mainly found in clusters at presynaptic locations.Release of the large vesicles and the small vesicles is regulated differently. The following is a list of neuroactive peptides coexisting with other neurotransmitters. Transmitter names are shown in bold. Oxytocin in the supraoptic nucleus co-exists with enkephalin, dynorphin, cocaine-and amphetamine regulated transcript (CART) and cholecystokinin. A 2006 discovery might have important implications for treatment of diabetes. Researchers at the Toronto Hospital for Sick Children injected capsaicin into NOD mice (Non-obese diabetic mice, a strain that is genetically predisposed to develop the equivalent of Type 1 diabetes) to kill the pancreatic sensory nerves. This treatment reduced the development of diabetes in these mice by 80%, suggesting a link between neuropeptides and the development of Type 1 diabetes. When the researchers injected the pancreas of the diabetic mice with substance P, they were cured of the diabetes for as long as 4 months. Also, insulin resistance (characteristic of type 2 diabetes) was reduced. These research results are in the process of being confirmed, and their applicability in humans will have to be established in the future. Any treatment that could result from this research is probably years away. There are studies investigating the relation of neuropeptides and CNS disorders including depression. 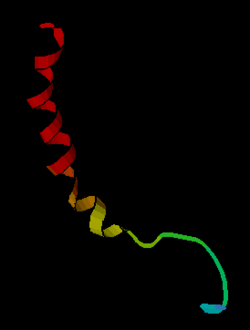 Wikimedia Commons has media related to Neuropeptide. Look up neuropeptide in Wiktionary, the free dictionary.